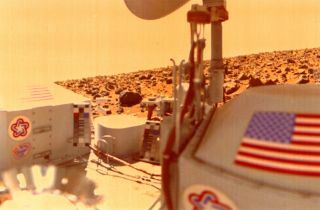 This view from Viking 2 was snapped on Nov. 2, 1976, showing a part of the lander's deck, the American flag, the bottom of the robot's high-gain antenna and a boulder-littered Utopia Planitia, the largest identified impact crater on Mars. PASADENA, Calif. — While robots have done the lion's share of planetary exploration to date, there are plenty of human stories to share about this ambitious enterprise. A panel of experts stressed this point during last month's Spacefest VI conference here, during a wide-ranging discussion that focused on the search for life on Mars. Chaikin also recalled how one of the scientists, Tim Munch, was in JPL's TV studio providing commentary to a global audience as they watched the first picture come in live. "Tim was about six foot four and kind of came across like Jimmy Stewart, like an absent-minded Jimmy Stewart," Chaikin said. "And he was just completely riveted to the screen. And Steve Saunders said, 'Say something, Tim. He says, 'I'm being told to say something. Well, there are rocks.'" The Soviet Venera 13 lander managed to survive the hellish conditions of Venus in 1982 and transmit data for two hours. The panelists — who, in addition to Chaikin, included planetary scientist and artist William K. Hartmann, space artist Mike Carroll, space journalist Leonard David and Rod Pyle of the History Channel — also discussed how a processing error resulted in the first picture of the Martian horizon having a blue sky. Once the error was corrected, the sky turned salmon pink. It was left to the late astronomer Carl Sagan to explain to the press that salmon is a perfectly acceptable color for a planetary sky. Ironically, while the sky on Mars is pink, the sunsets are actually blue, due to particles suspended in the sky — the reverse of what it is like on Earth. The talk turned to the possibility of human exploration of the Red Planet as well. An audience member asked what type of person would want to live in a Martian habitat, which would likely have to be buried underground to protect its occupants from dangerous radiation. "I think the answer is, they're going to have to be heavily sedated," Carroll joked, drawing a huge laugh from the crowd. "No, it does take a special kind of person to be an explorer. Those who go to Mars will not be going there for quality-of-life issues, obviously. Initially, it will be for the joy of discovery, for the science, and it's going to be a major sacrifice." After the Venera 13 spacecraft landed on Venus on March 1, 1982, the lens cap on its camera popped off as planned, providing scientists on Earth with images of the broiling landscape. Then the automated soil probe arm automatically deployed — and took a big chunk out of the lens cap, which was lying directly in its path on the ground. "So, 66 million miles to sample its own lens cap," Carroll said. "We know what those lens caps are made out of now."